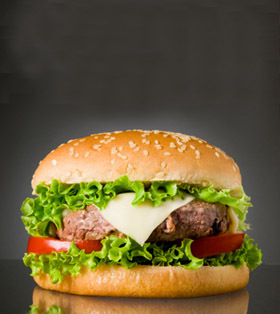 Give your beef burger or turkey burger a touch of smoke. Photo courtesy MackenzieLtd.com. WHAT IT IS: Artisan-smoked olive oil. WHY IT’S DIFFERENT: There are lots of flavored olive oils—basil, garlic, etc.—but this is one of the few (and the first American) smoked olive oils we’ve come across. WHY WE LOVE IT: We use lots of olive oil, and smoking adds something special. WHERE TO BUY IT: TheSmokedOlive.com. Here are two everyday dishes. There are more recipes (and more complex recipes) on the company website. These grilled shrimp are excellent as an appetizer, main dish or on salads. Soak bamboo skewers for approximately 5 minutes. Peel and devein shrimp, leaving tails on if desired. Thread shrimp on skewers and baste with approximately 2 tablespoons smoked olive oil. Sprinkle with salt and pepper. Grill over high heat for approximately 2-3 minutes on each side, or until opaque. Make sure to flip skewers only once. 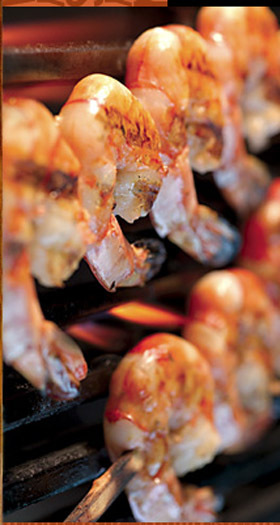 Shrimp can also be broiled until opaque, approximately 2-3 minutes per side. Drizzle with remaining smoked olive oil, or to taste (flavor mellows with cooking; most people prefer to drizzle with additional oil). Combine 3 tablespoons smoked olive oil, salt, pepper and herbs with beef or turkey. Form into 4 to 6 patties. Grill over high heat to desired doneness. Meanwhile, thinly slice onion and sauté in 1 tablespoon smoked olive oil over medium heat for approximately 4 minutes. Spoon onions over burgers and drizzle with remaining oil to taste. 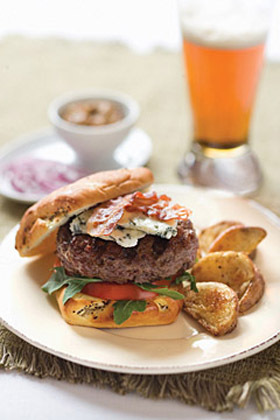 Serve with the usual fixings, with or without buns. Another old favorite goes smoky. Photo courtesy The Smoked Olive.